By now you've likely been swept up in Google's overhaul of the e-mail experience with Gmail. Simple and intuitive it offers one of the best e-mail options out there. 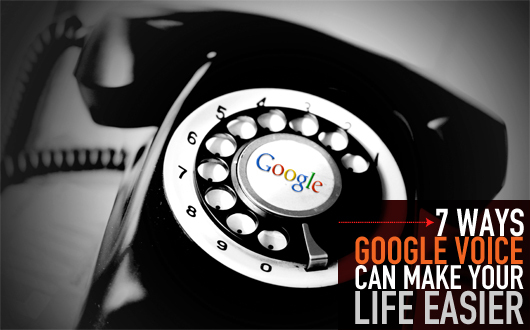 Now imagine what Google could do with the telephone experience. I like a simple life. I especially don’t want any more logins and passwords and URLs to check on a daily basis. That is why I fought using Google Voice for nearly a year. But a few months ago I caved and gave it a shot. Just a few months in and I can honestly say: I am hooked. I should know better and simply expect that a Google service would be amazing. Take a look at some of the awesome features and why you should get started with Voice. When you give out your personal number now, the only way to “shut off” incoming calls is to shut off or silence your phone. But if you’re anything like me, I leave mine on, just in case someone needs me as my cell phone is also my “house” phone. But in Voice you can set what hours of the day people with your Voice number can reach you. It is a great feature so clients (and sometimes family) can’t reach you at night or during your wedding. While it is not perfect, and sometimes it is downright comical, the computer does the best job it can in transcribing your voicemails. Additionally, you don’t have to call to get the actual voicemail as there is a play button in the email to listen to the actual message. It makes checking your voicemail in the middle of the day or when you are traveling really easy. Even better, if you are busy and can’t return a call or take action on the message, simply leave it in your inbox to remind you to take action. No more Post-It Notes needed! When someone texts your Voice number, it goes to your phone and your online Voice inbox. I am not the world’s more prolific texter and I prefer email for anything of significance, but this feature is slick. You send me a text, I get it in my inbox and can “text” you back via an online text. And since I don’t have an iPhone and don’t have the conversation text layout, seeing the entire text conversation in Voice makes it much easier to follow the conversation. Just like with having the ability to shut off people calling you during certain hours of the day, your personal number is now just for your closest friends and family. For me, it is too late until I slowly change people. But immediately after getting my new number, I put it up on Facebook. However, I sadly just had new business cards printed, so it’s not going to be personal for a long time, but if you do it fast enough, this will be a plus. Finally, this is very cool. Someone calls me about changing a meeting time, but there were three other people that needed to know about the change. If they left the voicemail on my Voice number, I can easily forward the actual voicemail to their accounts and then they will all now be informed, straight from the horse’s mouth. If these points haven’t convinced you, then I’m not sure what will. It’s free. It’s easy to use and set up. And quite simply, these features still amaze me and make managing my day-to-day communication much easier. If you don’t believe me, check out some of their videos (google.com/voice/about) to get a picture for yourself. Great article. I’ve been wondering if I should sign up and this clinched it for me. Nice work. Also, the ability to replace services on your phone (saving you money) is worth exploring. 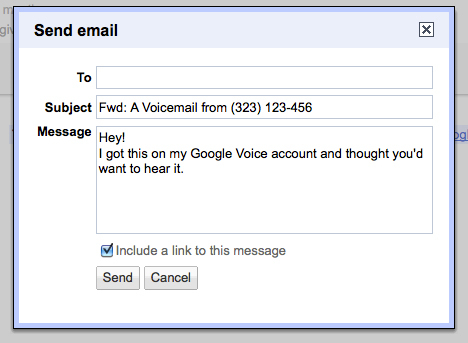 GVoice just came out with the ability to port over your cell number, too. Not available in Canada, either. Wish it worked in Europe! 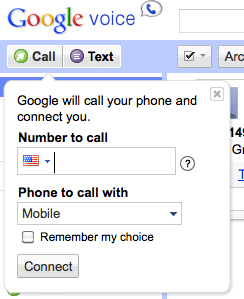 I discovered google voice about a month ago when I almost ran out of minutes on my cell phone plan. Now I use it as much as possible. Its great!